[A]: When another ::Gold Paladin:: Rides on this, you may call this to an (R). 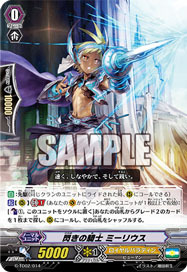 [S] [(R)]: [Choose a "Crimson Lion Cub, Kyrph", a "Knight of Elegant Skills, Gareth" each in your (R) and put them in Soul] If "Knight of Superior Skills, Beaumains" is in your (V), search your Library for up to 1 "Incandescent Lion, Blond Ezel" and Ride it, then shuffle that Library. See, the sun rises. Noe begins the true battle.